My original web site was a home-grown hunk of PHP that wrapped directories of text files in (circa version 4) HTML and CSS. The web has evolved a lot since 2003, though, and creating my own mechanism for templating simple content into responsive, beautiful HTML 5 and CSS just isn't a project I've got time for. Luckily, I found Bolt — a free CMS that's inline with all the things I've wanted to do in a CMS. Maybe now that I don't need time to write a CMS for myself I'll actually take time to add some content! A cold-smoker does not need to be an expensive piece of equipment. Time and time again on shows like “Diners, Drive-ins, and Dives” you see someone reusing some sort of metal enclosure to create a smoker (hot or cold). 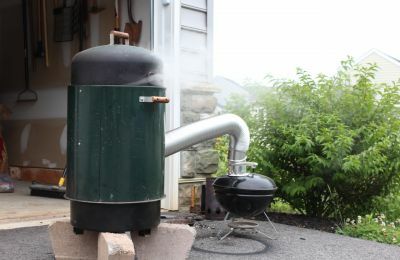 My apparatus employs a Weber “Smokey Joe” charcoal grill as the firebox and my Brinkmann bullet as the smoking chamber. The gqueue utility is used to simplify the task of submitting computational jobs to the Sun GridEngine (SGE) queue environment. SGE runs parallel jobs in a special context called a parallel environment. A parallel environment controls how a multi-node job is started and stopped. Serial jobs need not run inside a parallel environment. However, in all cases a job must be submitted to SGE as a queue script: an executable shell script that contains additional commands that influence how SGE will handle the job in addition to the actual commands associated with the computational task. gqueue removes the burden of writing an SGE submission script each time a user wishes to run a calculation: it writes the script for the user.